Adapting books is never an easy thing, especially with source material that brings out a wide range of emotion. J.A Bayona not only looks to do so with 'A Monster Calls', but succeeds, making one of the most emotional films of recent times. 12-year old Conor (Lewis MacDougall) is going through a tough time in his life, dealing with bullies and also with his mother's illness. To help deal with his problems, a tree-like monster (Liam Neeson) comes to Conor to tell him stories that will help Conor deal with the problems of life. J.A Bayona cements himself as one of the best talents in Film right now with his magical, emotional film 'A Monster Calls'. Bayona adapts the novel in a very unique way, with real life and imagination intertwining with live action mixed with effects and even water colour art style animation. 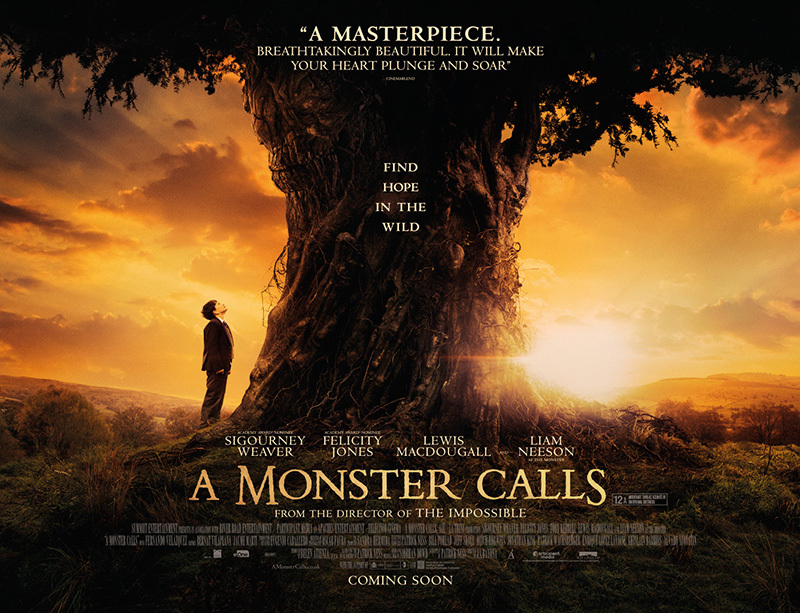 'A Monster Calls' is a very unique film that showcases an abundance of creativity throughout many aspects. For one, the relationship between the monster and young Conor is done magnificently well, as the Groot combined with the BFG like creature helps Conor deal with issues in his life. The monster voiced by Liam Neeson tells Conor of fantastical stories with crafty witches and dragons as well as having themes of betrayal and things may not be what they seem to like. The monster helps Conor see that not everything is black and white, happy or sad and even good or bad. This leads to the emotional parts of the film very well. The film is gaining some buzz around award season and for good reason. J.A Bayona is deserving of high praise for this film as he combines so many aspects so incredibly well. This is a superbly directed film as Bayona showcases his talent very well. Fans of the 'Jurassic' franchise can very much look forward to the 'Jurassic World' as Bayona shows how he can use effects for a monster whilst creating an engaging, emotional and interesting story. If you are one who is prone to tearing up at the cinema then make sure to bring your tissues. 'A Monster Calls' deals with some very serious issues, none more so than the illness of Conor's mother, played by Rogue One's Felicity Jones. It's truly heartbreaking at times as the emotion builds up throughout the film, climaxing to devastating effect. The performances help carry this, especially from Sigourney Weaver as the grandmother and Lewis MacDougall as her son Conor. MacDougall is great throughout the film, showing emotion at all the right times as he brings a very powerful performance. You feel for Conor throughout the whole film as we see everything through his eyes, with him struggling at school with bullies and at home with his family issues. Felicity Jones and Sigourney Weaver both provide great support in these emotional scenes too with their experience being very apparent. You feel a true relationship between Conor, his mother and grandmother, although it is conflicted at times. MacDougall does very well for someone so young with his facial expressions alone showcasing the character's emotions better than words could. The performance really helps make the movie as you need to feel the pain of the character to get the full effect. Thankfully, MacDougall brings a very strong performance to the table. The film is visually stunning as it succeeds on a number of levels. In a fantastical film like this, sometimes the effects aren't up to standard and may look clunky. However, for the Monster, there can be no complaints. The Monster is intricately and beautifully designed and one of the best uses of CGI in recent times. Not only does the CGI look magnificent but the way the stories are told are too. The use of animation but through as if it was being painted using watercolours was breathtaking. This was so unique and could've easily failed as it may not have got the message across. However, the beautiful artwork combined with Neeson's narration created some fantastic scenes, unlike any other I had seen before. This is a visual masterpiece and it will be a huge surprise if this film doesn't gain some nominations at least for its Visual Effects. 'A Monster Calls' is a very magical yet heartbreaking tale. It's fantasy elements do bring a lot of enjoyment but this is a film that will most definitely pull on your heartstrings. This is a special film that deserves its buzz around award season and one that audiences worldwide should be checking out. 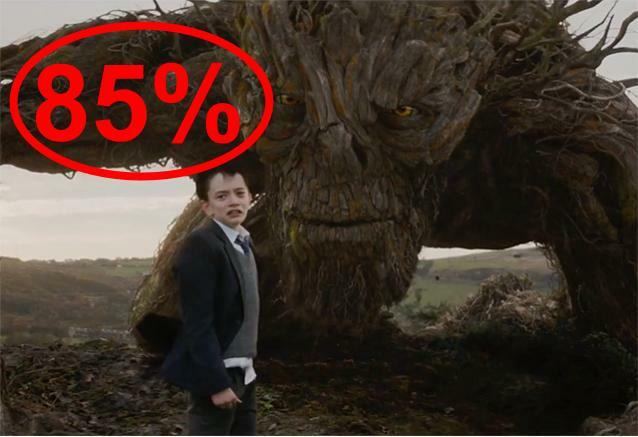 So have you seen 'A Monster Calls'? If so, what did you think of the film? I hope that this review was useful for if you were planning on seeing the film or not. Once again, thank you for taking the time to read my review, it is much appreciated!